I had found a sign on the ground back in the dark cold of January. The sign had fallen over and was left unattended. I picked it up, flipped it over and re-attached it. I painted a buffalo on it but that night it was so cold that my hands became numb and my heart froze a little. The painting looked awful. My warm message of love and friendship turned to ice. In between then and now I had put a large 4 foot square double-buffalo head painting on the sign. I injured myself in the process; stabbed my finger. It was removed by a fan in less than 24 hours. The whole thing kind of left me feeling bittersweet since I thought it was so good and colorful. My finger healed. The buffalos never came home. Six months since the cold January it is pushing 100 degrees and I am over-heated and sweat-soaked. I decided to use the cardboard from my East Atlanta Farmers Market performance painting show. I did not want to just throw it away. I have no room for this in my studio. 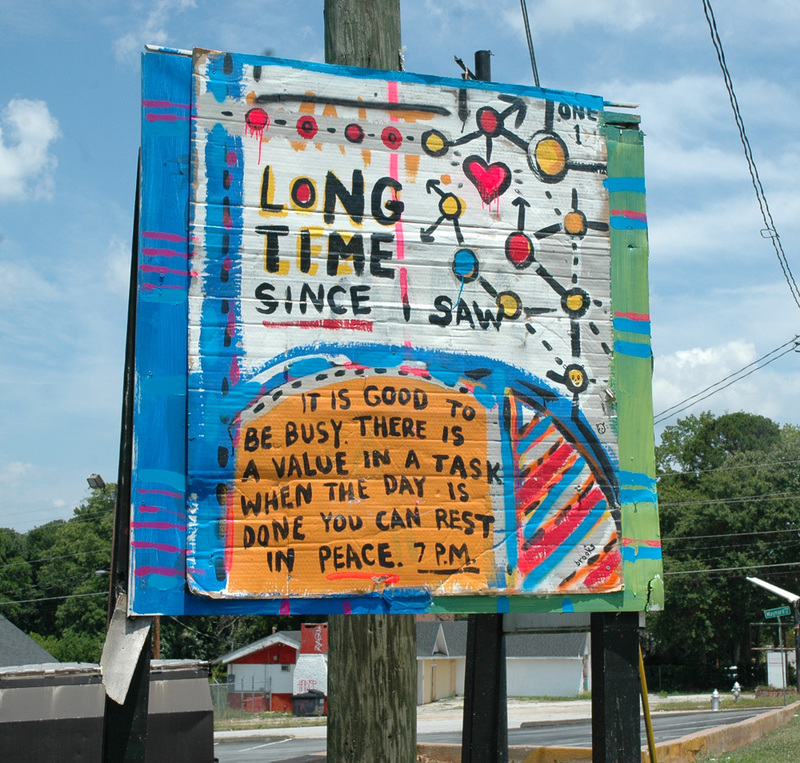 Today, I attached this cardboard folk painting to the sign and painted the edges. I hope this will hang around a while. The sign reads… It is good to be busy. There is a value in a task. When the day is done you can rest in peace. 7 pm. I might not be able to use myself or control my emotions or feelings. I am generally a mess. But, I know before my life is spent the Lord above (and all around) will use me for something and in some way He sees fit. 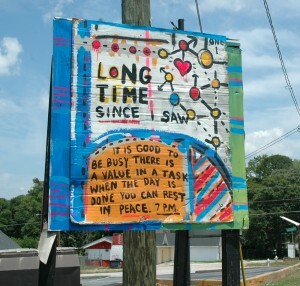 This entry was posted in street art and tagged blackcattips, eav, flat shoals, folk, neo folk, street aign, street art. Bookmark the permalink.